"Learning is the raising of character by the broadening of vision and the deeping of feeling." Family - By including and involving families in the learning process, and bridging the youth education program to the adult congregation, we aim to nurture the larger Sinai Synagogue Family. Sinai - The future of Sinai Synagogue, and the Jewish people, is an engaged, educated community. Today - Hillel says, “ . . .If not now, when?" (Ethics of the Fathers, 1:1). Whether it be on Shabbat, at a FEAST Family Sunday, or during weekday Hebrew education, Sinai offers opportunities to learn TODAY. Thank you to Cindy Tachman, former FEAST Director, for writing the original vision statement upon which this is based. The mission of Family Education at Sinai Today (FEAST) is to provide religious educational programming for children from infancy to young adulthood. FEAST currently has two components: Shabbat educational programming called FEAST Shabbat and the Hebrew education program. Hebrew is the language of the Jewish people. Having a rudimentary understanding of our sacred language and an ability to read (or decode) the Hebrew characters with ease are essential to participating in Jewish life. Sinai’s Hebrew education program is focused on creating and sustaining long-lasting ties to Jewish community and synagogue life. Students in Second and Third grade come one day a week to learn to decode the letters of the aleph-bet and basic reading skills. Fourth through Sixth grade come two days a week and work on improving reading and language skills, tefilot, and leading worship services. 6th grade students assist in leading the Torah service in preparation for Bat/bar mitzvah. This furthers our community’s goal of creating future ritual leaders and helping our students appreciate that Hebrew studies are not solely to be able to “get through their bar mitzvah”. FEAST Shabbat promotes: Shabbat as the time for the Jewish community to gather together for prayer, study and fellowship; that coming to shul on Shabbat is a positive experience; and that learning about Judaism with ones’ peers is enjoyable and memorable. Our objective is for children to know the what, how and why of Jewish Time, Jewish Text, and Jewish Community. 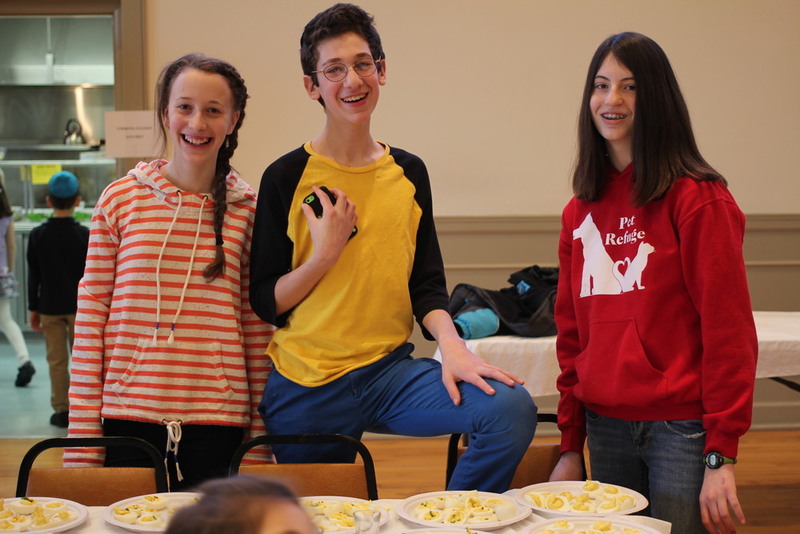 Teens at Sinai Synagogue participate in Passover education program.